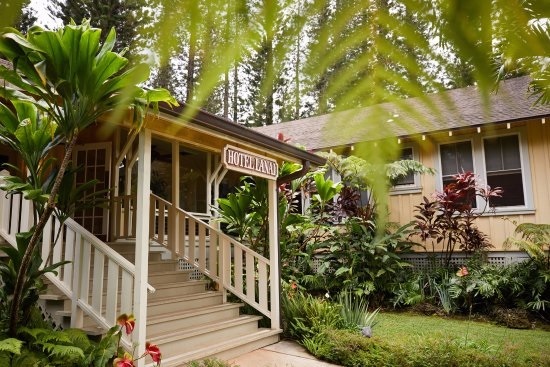 Hotel Lanai, a historic property located in the heart of Lanai City, Hawaii, has reopened its doors following a transformative renovation. The first guests were welcomed on December 4 to enjoy the hotel’s 10 guest rooms, main lobby, common areas and on-site restaurant, Lanai City Bar & Grille, which have been redesigned with upscale, rustic modern touches and charming Hawaiian vintage décor. Designed by John Milander Architects, Inc. and renovated by Lanai Builders, the interior design combines natural elements such as grasscloth wallpaper, bamboo and natural wicker furniture. Historic photos hung in the lobby and sitting areas recall Hotel Lanai’s roots dating back to 1923, when it was built as the first hotel on the island at the height of the pineapple plantation era. Each guest room offers unique furnishings and fixtures, such as a custom ornate wood headboard or handmade pendant lamp, and views of the lush gardens surrounding the hotel. Guest rooms are equipped with a control panel to customize light, blinds and temperature preferences at the touch of a button, a flat screen TV, and other modern amenities. Lanai City Bar & Grille, Hotel Lanai’s on-site restaurant, features a new bar and upgraded outdoor seating area. The restaurant takes on a new culinary direction with the hiring of Executive Chef Joel Harrington, who will introduce Sunday brunch service and an all-new dinner menu. Harrington has cooked at critically acclaimed restaurants and premier hospitality institutions throughout the U.S., including celebrity chef Marcus Samuelsson’s Aquavit and Red Rooster Harlem in Manhattan. His vision for Lanai City Bar & Grille’s new menu is “global cuisine with an island fork,” celebrating the culinary heritage of Hawaii with local products such as Lanai venison, while incorporating Asian and American flavors and techniques.